The Brazilian crew of DEATHRAISER showed me that no matter what will happen, world gone dead or all other bad things that can happen to us the human race, the aggressive side of old school Thrash Metal will never change. Whether it is the lyrical themes or the music itself, it will always remain the same or something close to it. The band's debut album, "Violent Aggression", brought back the sounds of early KREATOR, SEPULTURA and SLAYER out of the coven. Sure it was great to hear this kind of extremity with a massive dose of speed once again, but, and there is always a but coming, what else? In overall, these guys wrote the music for the debut just as extreme Thrash should sound. There was a very nice old school production that gave the grounds for unmerciful rhythms, barking vocals al'a Petrozza of the old days and SLAYER kind of solos which attacked from both sides. There is no doubt that they lived up to the take on the world while creating something mayhemic and wild. However, I couldn't shake it that the material on "Violent Aggression", besides the repetitive side of its themes, that almost every single track was similar to the ones coming next. If you thought that it was a big happy thrashy family, think again. DEATHRAISER turned out to be quite a monotonous band presenting a droning type of music. They may have sped all the way to hell with their aggression but their stuff kept on being the same all the way down under. The riffs may sound intelligent, and some were, yet, when those were being repetitive, I ask what it so clever about that? Just so you know, I found the beginning of the album quite good with tons of energies and a lot of anger. 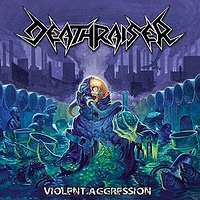 The self-titled track, "Violent Aggression", was a kind of reminder of the old "Endless Pain" and "Pleasure To Kill" albums of KREATOR and those meant a murderous character. Nevertheless, that same track was the only good thing that I liked on this album. The other tracks were quite normal for the subgenre, sometimes a bit above. You can also check "Enslaved By Cross" and "Command To Kill" as additional likeable tracks. I believe that the main issues that I mentioned, like being banal and repetitive, were the elements that maneuvered the album into a lower position. Old school Thrash Metal always had its extreme side so people would break each other apart in the moshpit. Without a doubt that this type of speedy Thrash has its advantages of being utterly energetic with tons of adrenaline, yet when a band is playing almost the same stuff over and over on the same album, it is way enough and it could lead to total disappointment. Thankfully this is the band's debut and they have a road to go before reaching the top.